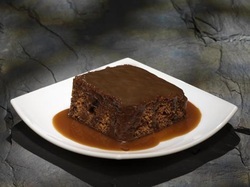 Our Sticky Toffee Pudding has many imitators, but I have not found one that is in the same league. If you sell a Sticky Toffee Pudding, that isn't ours, give us a ring and I will get you one to taste, I guarantee you will love it. They are not those round, mass produced puddings. Ours are hand made and look just like you have made them yourself. Just take out of the freezer, pop into the microwave for a couple of minutes (or less, depending on your microwave),and they are ready to serve.